Just in case you didn’t think Tom Cruise was impressive enough already, it’s now been revealed that in order for him to complete a nautical stunt for Mission: Impossible - Rogue Nation, the blockbuster stalwart had to hold his breath for between 6 and 6 and a half minutes. He went to such lengths because Cruise wanted to get the underwater scene shot without a single cut in order to create more suspense. The guy is a bona-fide hero. We wanted to create a suspense underwater sequence with cuts. So doing that sequence was really interesting. We’re underwater and we’re doing breath-holds of 6 to 6 ½ minutes. So I was doing all my training with the other stuff (on-set). It was very taxing stuff. I’m going to predict that "taxing stuff" doesn’t even come close to describing just how strenuous training and filming the scene was for everyone involved. Especially the people who had to make sure that arguably the most renowned actor of the last 30 years was kept alive. In order to be in peak physical form for this sequence, Cruise worked along Kirk Krack, who is a performance underwater trainer. He gave him the training that allowed the 52-year-old to be able to hold his breath for that long. And the fact that Tom Cruise is still alive and well suggests that he did a bang-up job. 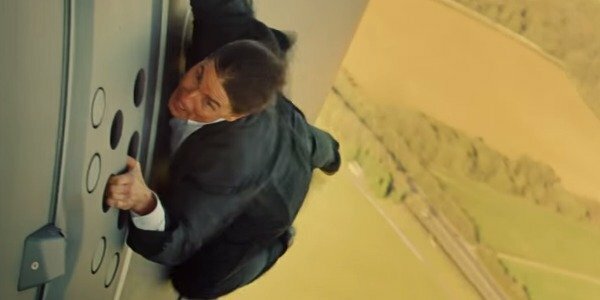 The latest trailer for Mission: Impossible - Rogue Nation gave us a sneak peak of Tom Cruise’s underwater extravaganza in the impending blockbuster, which, if you haven’t watched yet, you should immediately do so below. Let’s not forget that this isn’t the first death-defying stunt that we’ve been told Tom Cruise performed for the fifth instalment to the increasingly spectacular franchise. Cruise also made the decision to hang off an A400 plane as it took off, too. All of which suggests that Mission: Impossible - Rogue Nation is going to be one of the most outrageous, over-the-top and scintillating blockbusters of the year. We’ll see if it’s just that when it’s released on July 31st.